Where does Canaan fir fit into the scheme? Canaan fir is so-named because several of the original trees with the intermediate morphology were identified from a limited area in West Virginia, generally referred to as the Canaan Valley. Taxonomically, Canaan fir is considered the same as bracted balsam fir and has the scientific name of Abies balsamea var. phanerolepis. However, growth traits of the trees from these southern regions are somewhat different than for other bracted balsam fir. Thus, there occurs a dilemma as to how Canaan fir should be classified. There are lots of opinions. 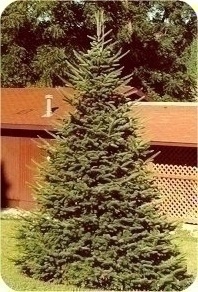 The simplest solution is probably to consider Canaan fir as a special ecotype of bracted balsam fir; this ecotype having unique characteristics as a result of the environment to which it has been exposed. It is not currently considered a separate species.